From an outside perspective, launching your own photography business may seem simple enough. 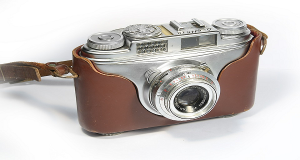 All you need is a great eye, a professional camera, and a good WordPress website where you can share all your latest projects. Unfortunately, becoming a successful photographer is more complicated than it might seem. Without a commercial photography marketing plan, you’ll soon find yourself struggling to earn more photography clients, and desperately searching for ways to make ends meet. That’s why, before you launch your online company, you need to figure out how to market your photography business with a website, a content plan, and a social media strategy. To get you started, here are 3 crucial things you need to know about commercial photography marketing. Many photographers convince themselves that all they need for a successful website, is a homepage, an “about” page, and a portfolio of all their previous work. Although this is a great way to showcase what your brand is capable of, it’s ultimately more of a glorified resume than a marketing tool. If you want your customers to find you online, then you need to rank for relevant keywords on the major search engines. And this means expanding your website as much as possible. Think about how you might search for a photographer if you were a potential client. 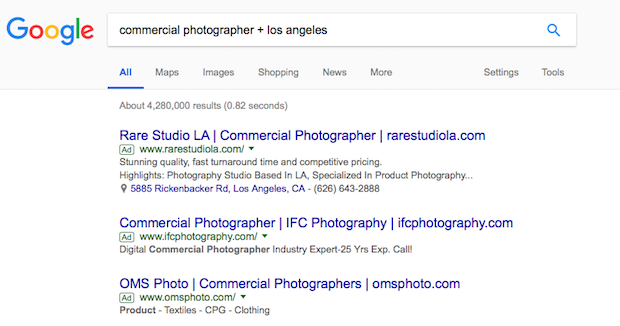 Assuming you didn’t know the network of camera enthusiasts you know today, you’d probably go on Google and search for “Commercial Photographer [City]”. For your website to show up for searches like that, it needs plenty of pages that link back to those keywords. Think of your website like a town. Every page on your site is a building. And while some people will be looking for the restaurant, others will be looking for theatres, police stations, etc. If your website is the classic 3-page site, then you’re not going to be able to serve up much of an experience for your visitors. When it comes to figuring out how to market your photography business, you’ll soon discover that content is key in the online world. While the pictures of previous weddings and events that you post on your portfolio will give prospective customers a good idea of what you can create for them, they’re probably not going to go to a search engine and look for something like “Nick and Cloe’s wedding 2017”. By producing relevant content about photography, the techniques you use, and the things that you can do for your customers, you demonstrate your authority in your niche. And you give yourself additional ranking potential online. What’s more, if your content is useful enough, it could become “shareable,” meaning that it starts to earn attention on social media, spreading brand awareness for your company to new customers around the world. Commercial photography marketing starts with learning how to demonstrate your value to your audience in a unique and compelling way. While blogs and articles might take time to generate a response, they’ll also act as a long-term solution for lead generation. You Need to Be Social! Finally, it’s important for any budding photographer to remember that there’s more to being active online than simply publishing blog content and waiting for your rank to go up on Google. In today’s digitally-connected world, it’s more important than ever to get out there and build relationships with potential customers. The great thing about commercial photography marketing on social media is that professional photographers are already at an advantage. They have plenty of great visual content to share. Since Facebook posts with images get up to 2.3 times more engagement than their photo-free counterparts, you’re off to a great start. Being successful in commercial photography marketing is about more than just finding a great WordPress theme or sharing your previous work. If you want to get ahead in the photography game, then you need to learn how to make the most of online marketing across multiple verticals. How do you market yourself online? Do you have tips other than the above? Feel free to share your thoughts below. And, as always, follow us on Facebook and Twitter for even more tips, advice, and resources.